Deerfield Park District Preschool is a not-for-profit early childhood program licensed by the State of Illinois. Our classrooms are specially designed to meet the needs of young children and are located in a secured area on the second level of the Jewett Park Community Center in the heart of Deerfield, Illinois. We offer part-time enrollment for children 2 ½ years through 5 years of age. Deerfield Park District Preschool is a developmental program designed so that children learn to play and play to learn. 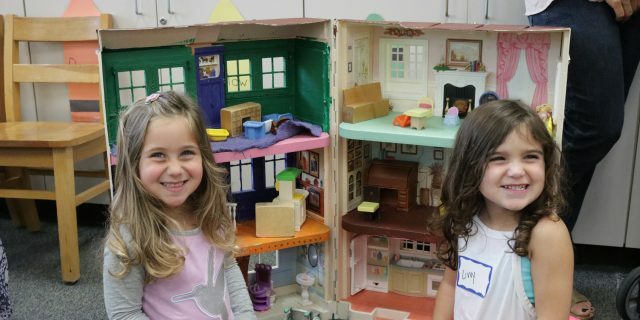 We believe that through play and problem solving, children learn the basic skills necessary to achieve – socially, emotionally, intellectually, physically, and creatively. Our programs are planned to reflect the changing developmental needs of children in each age group through individual and group activities. Our goal is to provide a warm, nurturing, quality preschool environment, recognizing that each child has her/his own unique style of growth and learning. We believe parents and teachers are partners in children’s care and education helping children grow in confidence and self-esteem. Young children construct their understanding of the world through active exploration. Our well-rounded curriculum includes opportunities in math, science and nature, literacy, language and listening, dramatic play, and daily outdoor play. Our teachers strive to create the best possible learning environment for each child. Art and music teachers enhance the daily program. Our dedicated experienced teachers are early childhood educators committed to helping children develop to their fullest potential. We are proud of maintaining a low student-teacher ratio. Give us a call to set up a tour or get more information. Or sign up for a tour online!